The use of sonar, or “fish finders”, has had a dramatic impact on the sport of fishing. In the past the area below the surface of the water was generally a big mystery. You could tell the depth in a specific spot by dropping an anchor or letting a jig run down to the bottom, but they gave you little idea of the depth around you. Is the bottom flat or sloping downward? Is it muck, gravel, rock, or weeds? You can even see congregations of bait-fish and the thermocline on most modern day sonar units. I remember the first time I fished from a boat with a sonar unit. I assumed it’d be incredibly easy to start pulling in fish. The sonar would point them out, I’d drop a bait in front of their faces, and ten minutes later I’d be home with a live-well full of fish. In reality, it doesn’t work like that. While the sonar does give you a much better perspective on the environment below the surface of the water, it still takes a lot of skill and a little luck to read that environment and present some bait near some hungry fish to entice a bite. 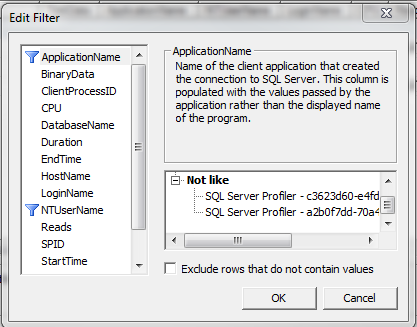 In SQL Server, we can use a trace to look at what is going on “beneath the surface”. Up through SQL Server 2008 R2, a trace is one of the best ways to identify long running transactions, find deadlocks, measure stored procedures’ performance, and try to figure out what that third party software application is doing to your database. After 2008 R2, extended events become the preferred method to do these things, but this post will be focusing on the trace. A SQL trace is events and data that are collected through the use of some internal SQL stored procedures. The events are specific things that happen within SQL Server, and the data is the details that are associated with those events. Through the use of filters we are able to zoom in on only the events we want to see, and only the details about those events we want to record. It is important to use the filters wisely because running a trace where many events and data are being recorded can significantly slow down the system. Care should always be taken when running a trace in a Production environment! After choosing which Server Instance to run the trace on, you can choose which events and columns (the details) you want to trace. 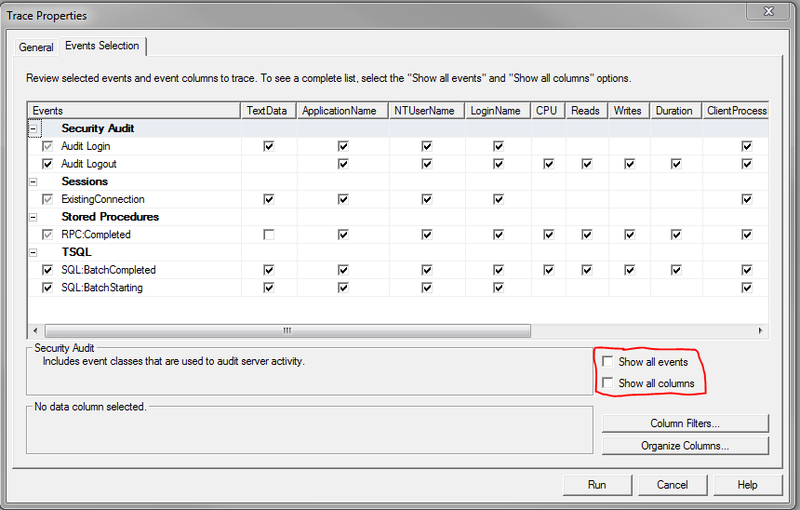 Use the “Show all events” and “Show all columns” checkboxes to display all the events and data you may want to monitor. 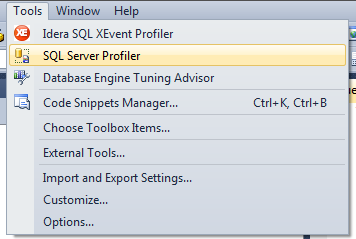 Clicking on the Column Filters… button will bring up a dialog box to choose the filters. 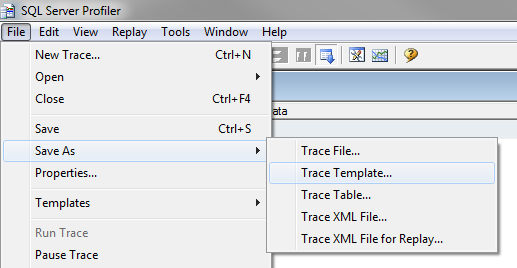 You can filter on any of the columns that are selected for the trace. After clicking Run, the Trace will begin. 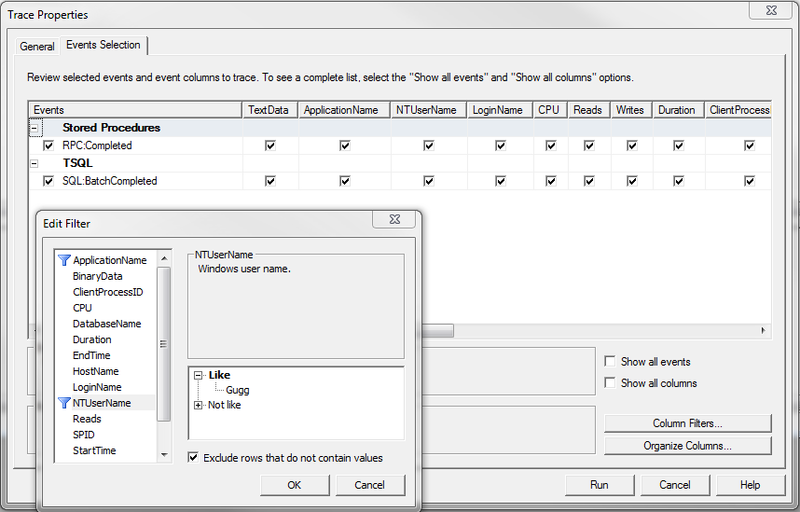 One great option for traces that you will be running often is to save your columns, filters, and events as a trace template. After starting the trace, go to File -> Save As -> Trace Template… to save this template. This allows you to simply choose the template next time you go into Profiler, instead of having to once again set up all the columns, filters, and events. One template I like to set up is for performance tuning a stored procedure. For this template I set a filter so the only login it grabs is mine. Then I choose the Stored Procedures RPC:Completed and TSQL SQL:BatchCompleted events, and make sure I have the CPU, Reads, Writes, and Duration columns selected. With this setup, I can execute a stored procedure or SQL statement, see the amount of CPU, Reads, Writes, and Duration, then make a change to the SQL and execute it again. This will let me see whether the change I made to the SQL statement resulted in better performance, worse performance, or didn’t change the performance. Now you can set up a SQL Agent job to start the trace each morning, stop the trace each night, save the trace as a file, and save off any relevant results to specific tables. I like to save off deadlocks in their own table, long running blocks in their own table, and long running stored procedure in their own table. Using this method I also get a log of trace files, so if anyone wants to know if we had any database issues 8 days ago at 11:50 AM, I can pull open the trace file from that day and take a look. Lastly, I can set up a script to look at the current trace file and look for any unusual results. If I see a stored procedure is taking an average of seven seconds to run while historically it took just two seconds, I can ask myself what has changed with this procedure or the way it is being called as a way to troubleshoot poor performance with the entire system. Here is the script I use. It first provides a summary of the day. It then works with a table where I keep historical results called dbo.HistoricalPerformance to find stored procedures that are performing poorly compared to past performance. It assumes a trace naming convention that includes the date in the file name. I hope this information has given you some ideas of ways to use SQL Trace to improve the health of your database.